Hello everyone. Today I am going to share a project I made using Sin City Stamps and a really fun product called Composi•mold reusable mold making material. I started this Faber-Castell mini mixed media journal in a previous post, entitled Things I Love. You can see my previous post by clicking here. To learn more about Composi•mold, I found a wonderful video tutorial here which explains how easy it is to use. 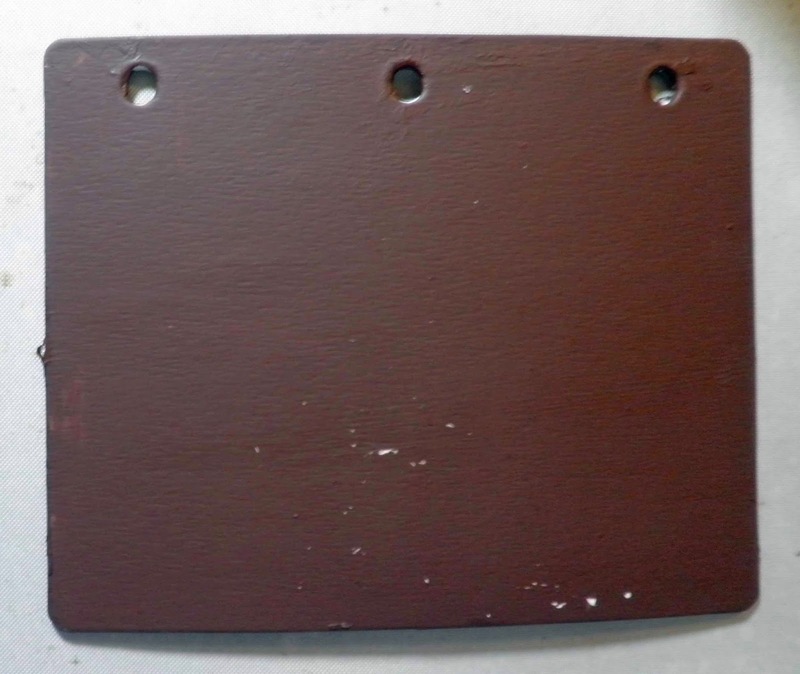 I first painted one page with Burnt Umber acrylic paint on both sides. 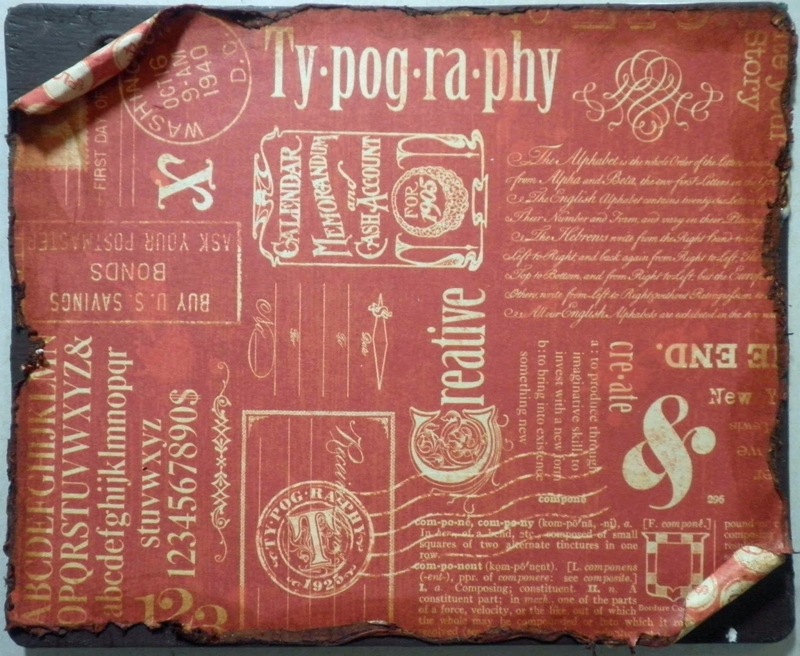 Then I trimmed a piece of G45 Typography paper to 4-1/2" x 5-1/2" and heavily distressed the edges. I further distressed the edges with Vintage Photo distress stain. I like to use the stain because it softens the edges and absorbs the color better. I used a small round stick to curl two of the edges. Then I adhered this piece to the page. 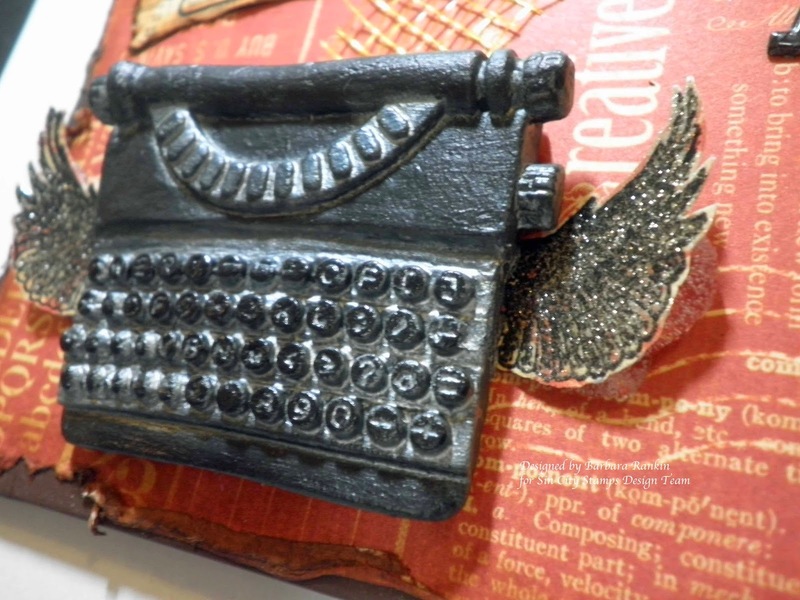 I had this metal typewriter embellishment from Michaels in my stash and wanted to replicate it for this project. 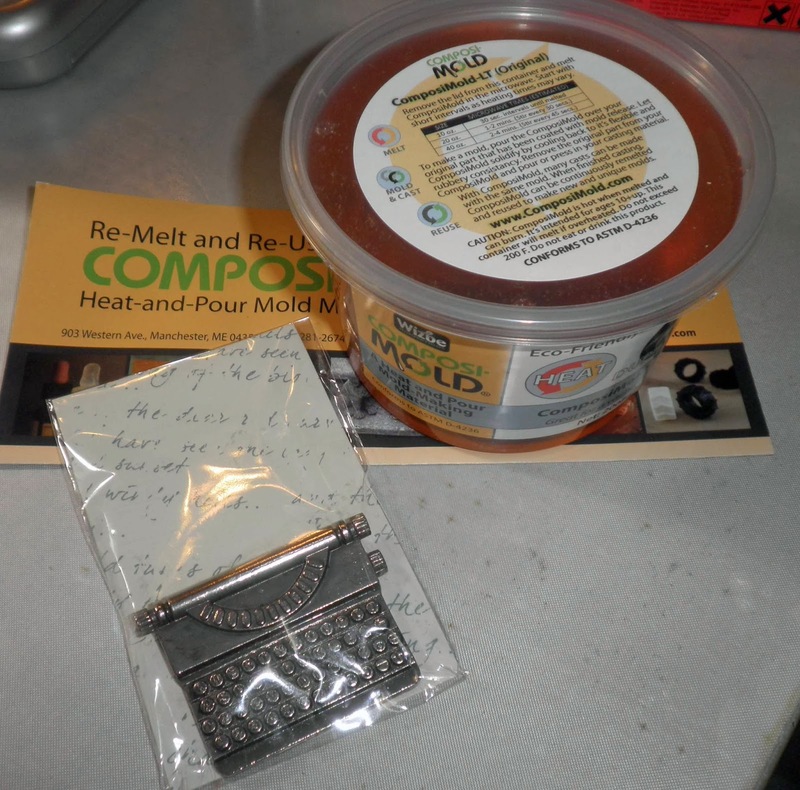 So, I turned to this fabulous mold-making product called Composi•mold. Following the easy directions on the package, I made the mold. If you would like more information on this process, please see my previous post. 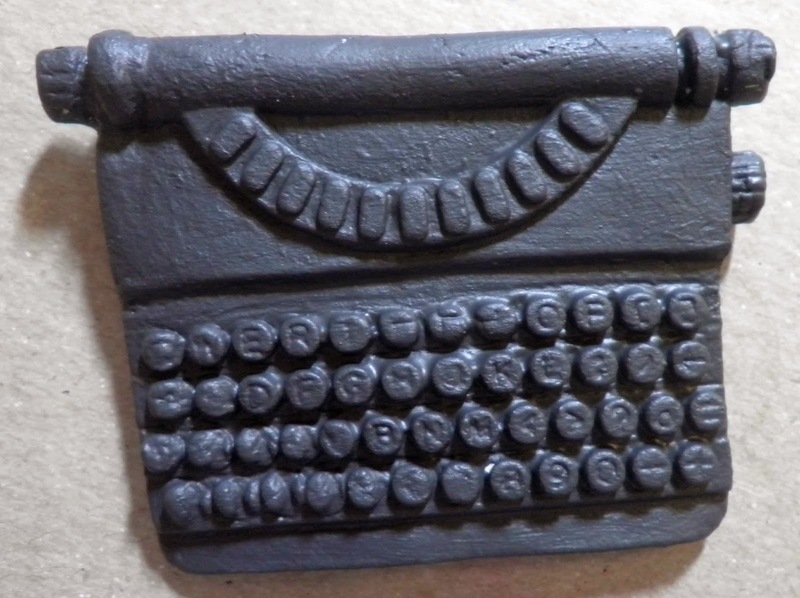 Next, I used Creative Paperclay® to make my copy. First, I placed small pieces of the paperclay into the tight spots along the sides, as shown. Then I finished filling the mold and turned it over to see if I got all the nooks and crannies filled. 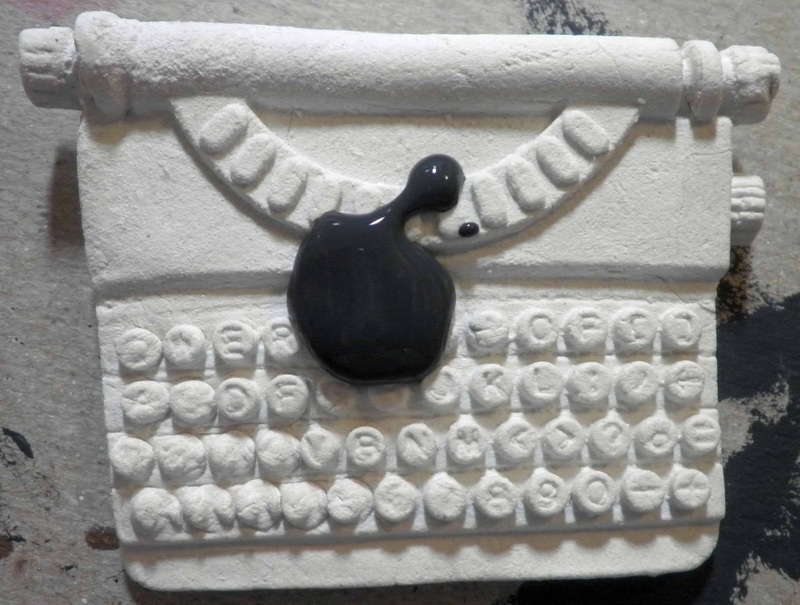 Allow the paperclay to dry a bit before removing it from the mold. Before the clay is completely dry, you can smooth edges and do any fine trimming, if necessary. After the clay dries, you can also sand it to smooth out any roughness. 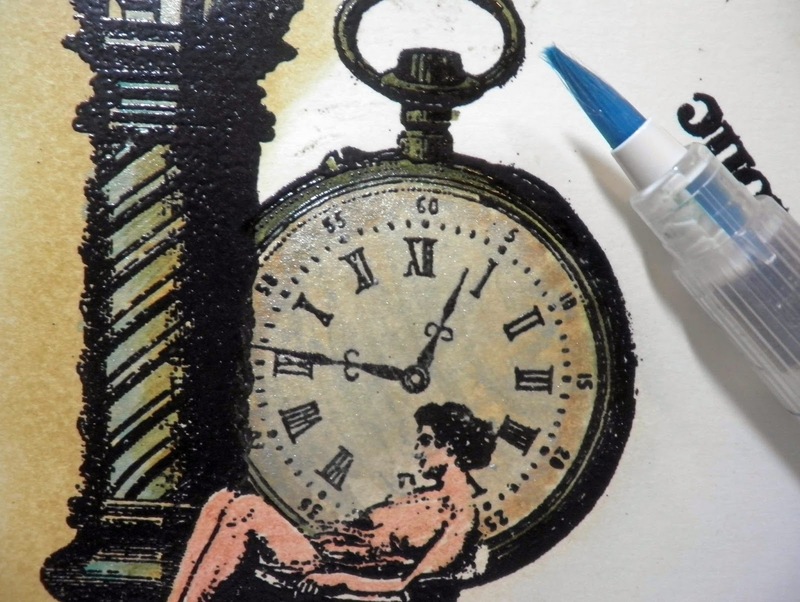 Paint entire piece with black acrylic paint and let dry. Apply a wash of silver acrylic paint over the piece and wipe some of the excess off of the top. Next, I hit the high spots with archival black ink. Set aside to dry. 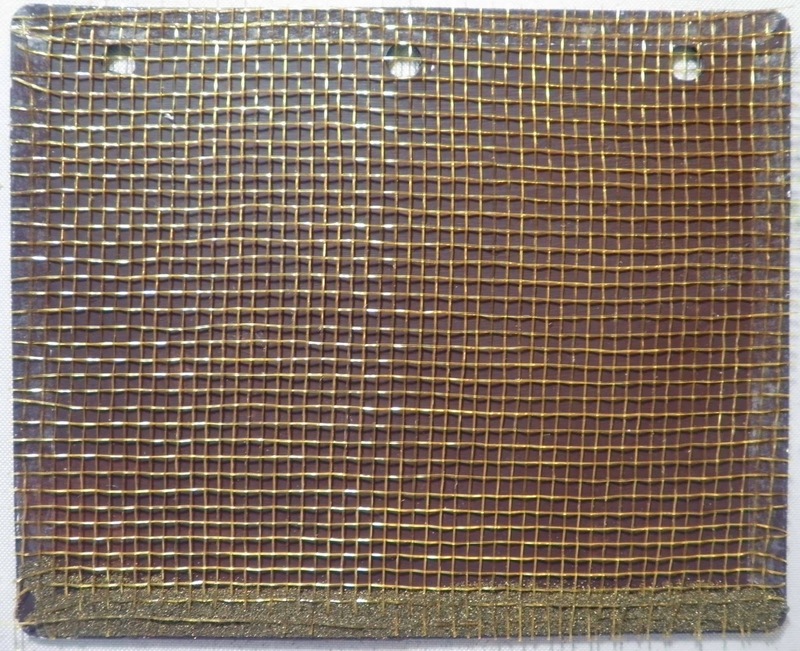 Adhere typewriter embellishment to lower left of page, over scrap strip of gold mesh paper. Stamp wings from Wing-It plate onto scrap print paper from Graphic 45 Typeography paper using Versamark and black embossing powder, fussy cut wings and adhere to each side of typewriter, raising them onto either foam dots or heavy glue. I used a big blob of Helmar 450 glue because it dries clear and remains dimensional. 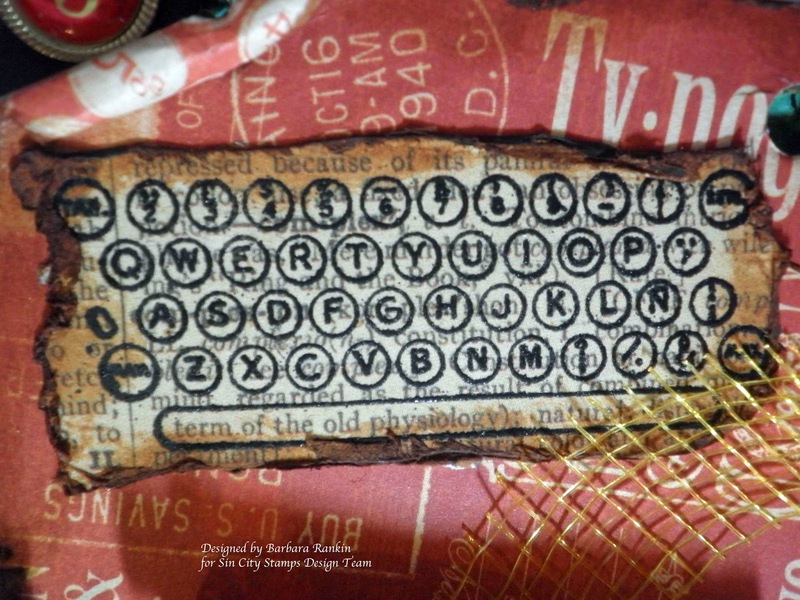 Stamp typewriter keyboard from Dressforms onto same scrap print paper from Graphic 45 Typeography paper using Versamark and black embossing powder. Distress edges with Vintage Photo distress stain and adhere above typewriter. Adhere the other side of the mesh strip to the right side, pulling it taut, as shown, and adhere metal letters (TYPE) I found in my stash over the end. I also found these letter brads in my stash, so I removed the brad prongs and attached them with Glossy Accents. I adhered two red metal numbers at the corners where I had curled the paper back. See photo above. 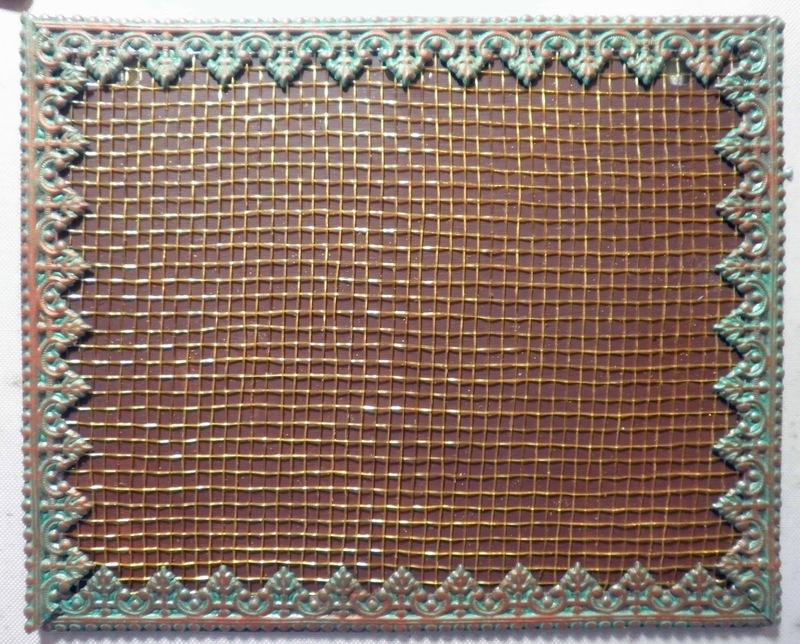 Here is what I did to the reverse side. 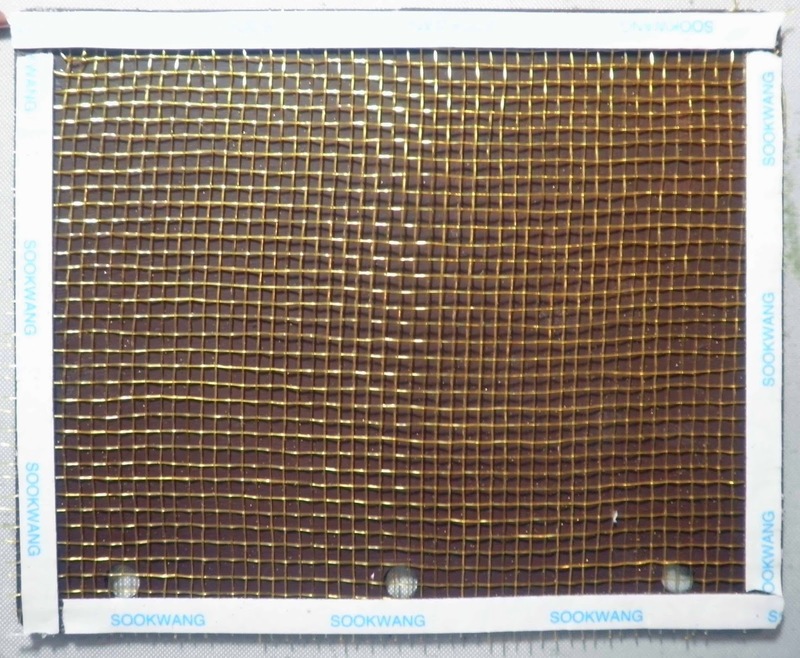 I found this scrap of mesh material in my stash, so I trimmed it to size and adhered it to my page with scor-tape, or similar double-sided adhesive. 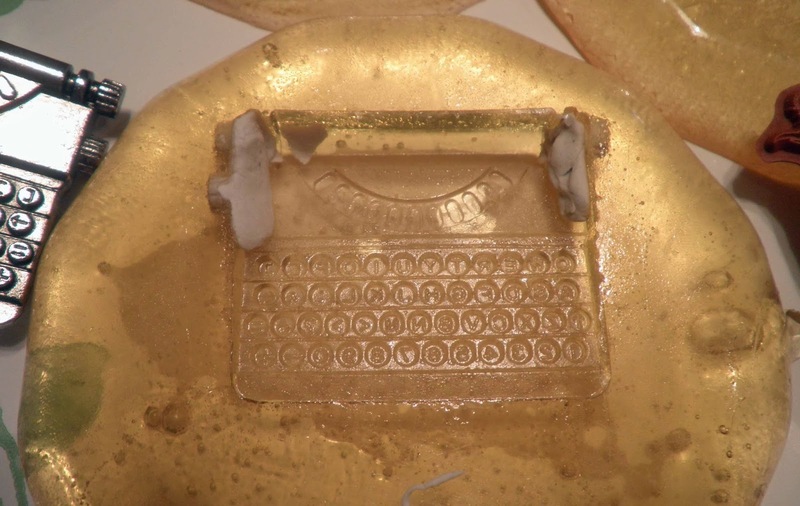 The picture below shows where I had this brilliant idea to attach the mesh by pouring gold embossing powder over the scor-tape and the mesh and heating it. 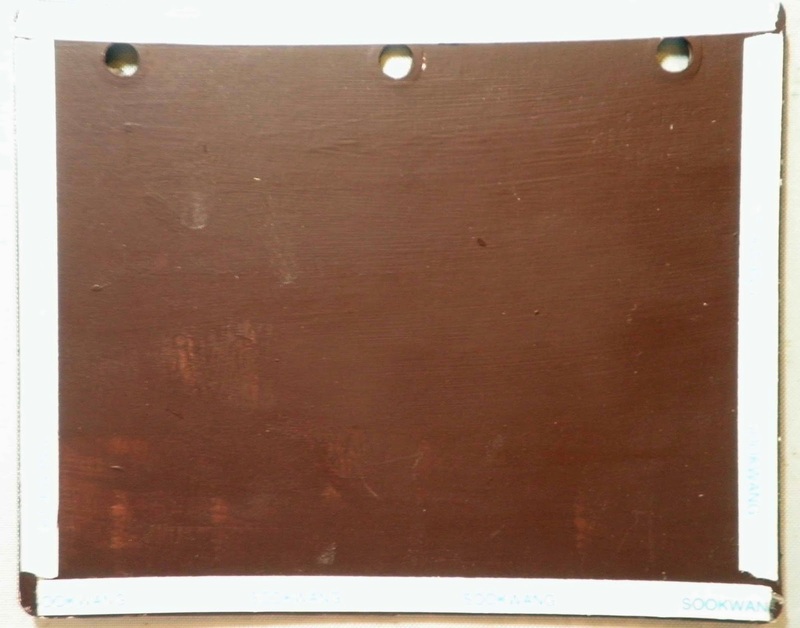 The idea was that the melted embossing powder would hold the edges down and adhere it with a nice, embossed edge. Unfortunately, the mesh was apparently plastic, too, and wanted to melt as I attempted to heat the EP. So, on to Plan B. Plan B: Adhere a second strip of score-tape along the edges again, right over the mesh and first strip of scor-tape, to which I will adhere German scrap borders. 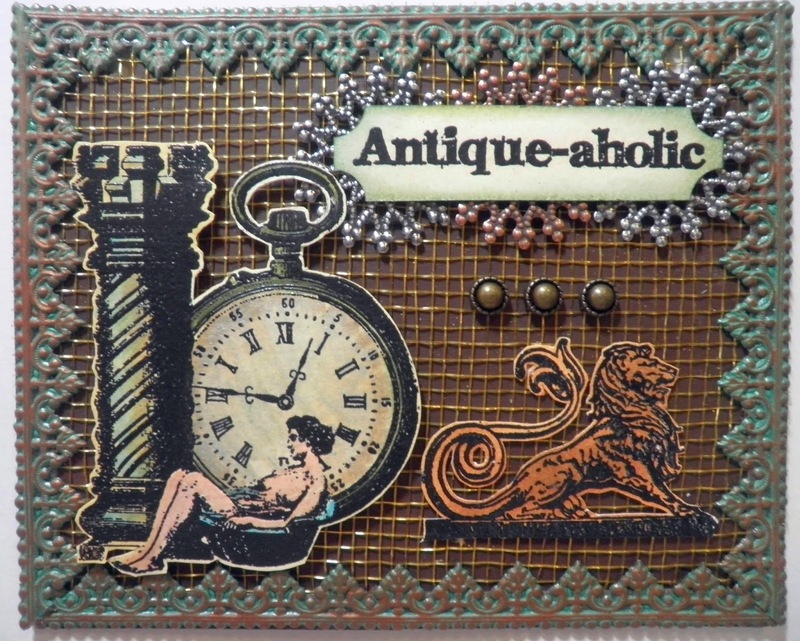 If you want a more vintage look, color strips of German scrap borders with Gilder's Paste or Metallic Rub-on creams. 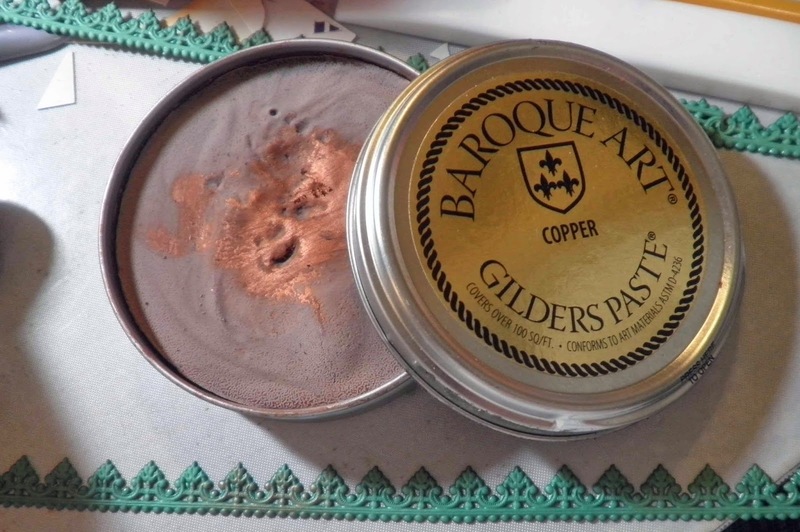 I used Copper Gilder's Paste. Adhere German scrap border strips to the scor-taped edges, mitering corners for a neater look. I love how this looks now, and in retrospect, I think this ultimately looks better than if Plan A (with the EP) had worked. Now that my base is done, I need some embellishments. So, I stamped three images from the Wing-It stamp plate in Versamark ink and black embossing powder. I sponged Rusty Hinge and Brushed Corduroy distress inks over the lion, Antique Linen over the watch face, Antique Linen with Peeled Paint over "Antique-aholic" and, and Scattered Straw over the column. 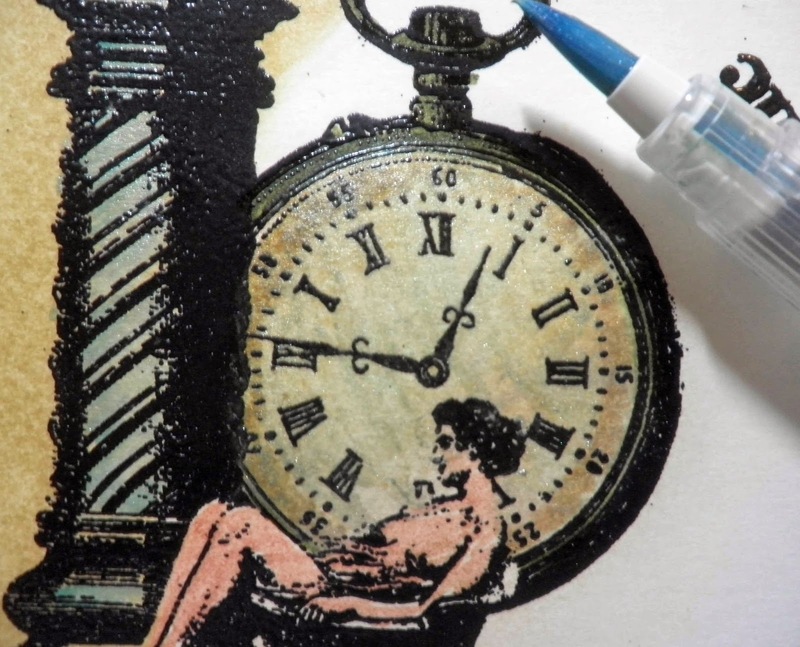 I colored the woman with a Tattered Rose distress marker, the watch with a Peeled Paint marker, and added color to the column with a Tumbled Glass marker. 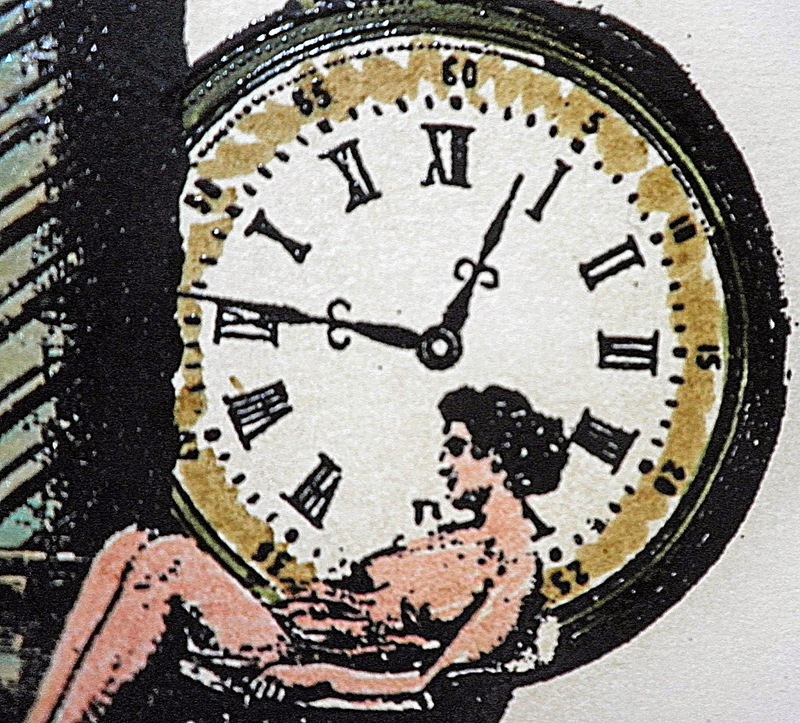 I then added shading to the column with a Scattered Straw marker and a Tea Dye marker around the clock face. Then I blended all the colors with my water brush. 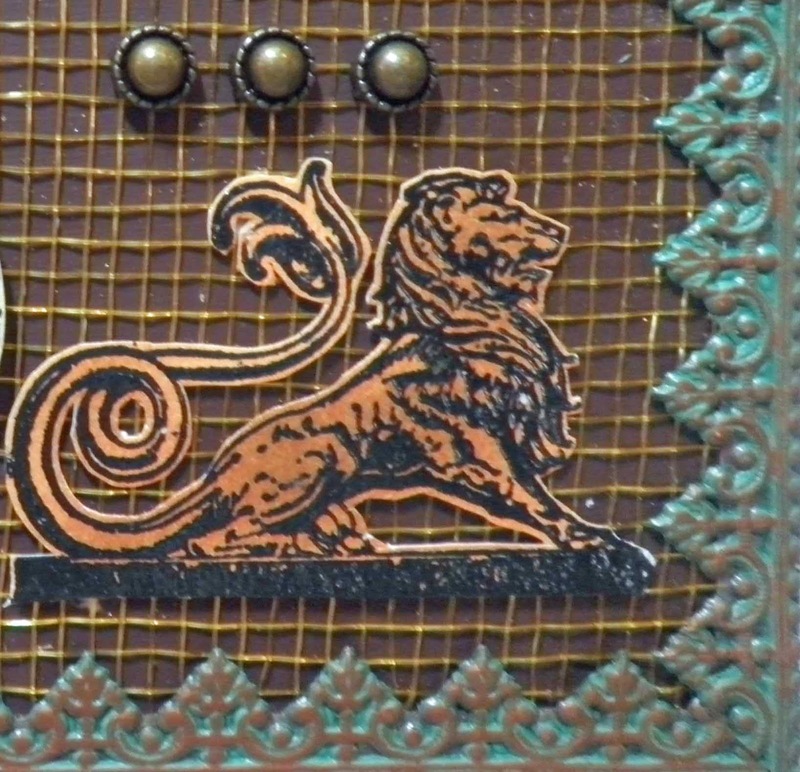 Next, I fussy cut the pieces and adhered the column collage image to my page with foam dots, and wet glue for the lion image. Adding these three metal studs gave it some added dimension and interest, as well. 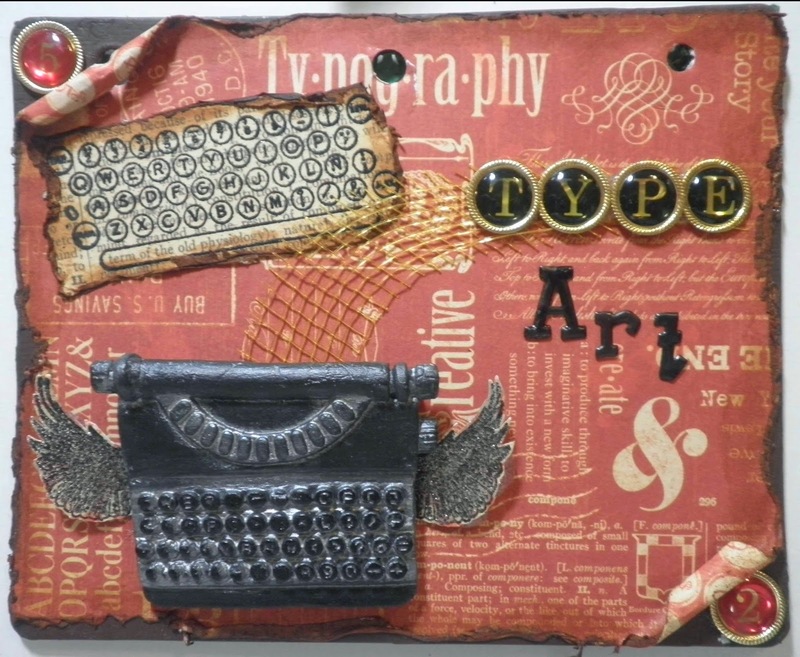 Next, I used a ticket punch on the "Antique-aholic" piece and edged with Peeled Paint Distress Ink. Then I adhered some metal filigree jewelry findings in the upper right corner and attached my "Antique-aholic" piece over that. This gave it some interest with a bit of dimension. 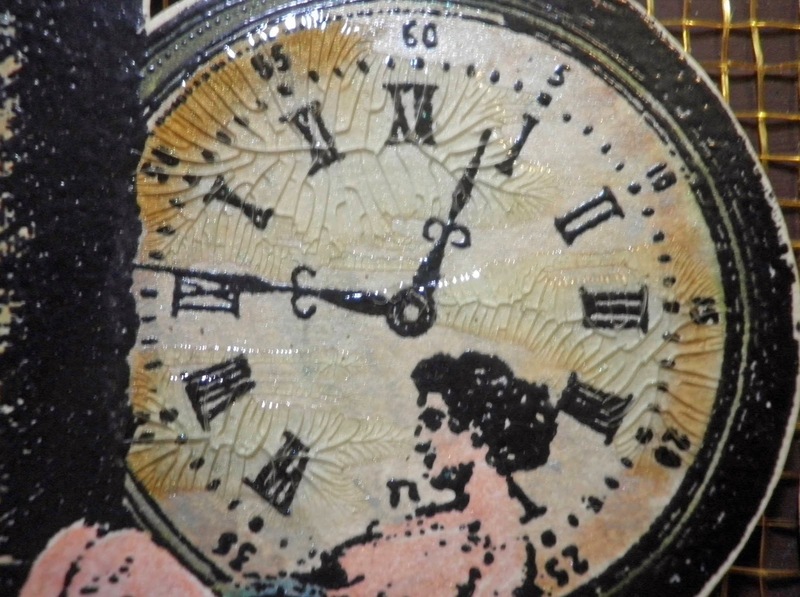 The last thing I did was add small areas of Crackle Aceents over the clock face to imitate a broken, shattered clock crystal. 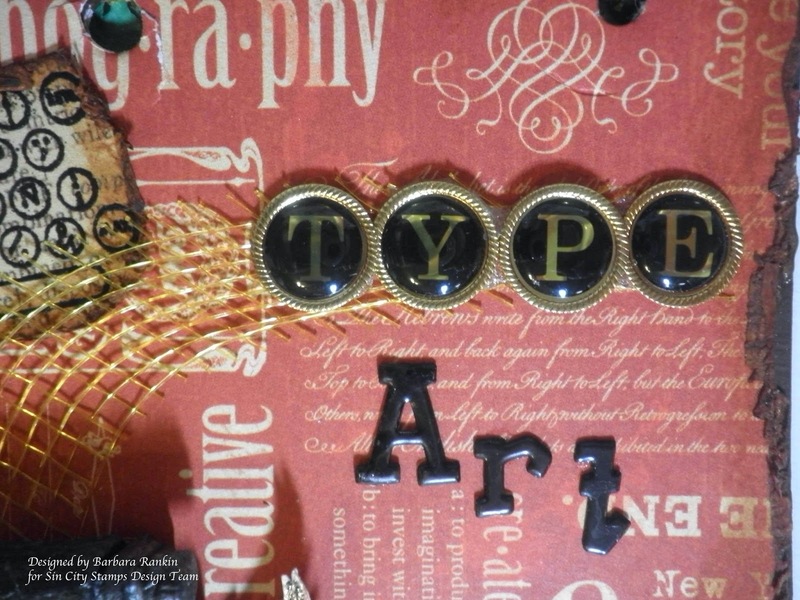 I hope you are enjoying all of this month's DT posts and inspiration using stamps, embellishments, and Composi•mold. As I said before, this is so easy to use and lots of fun. I hope you will give it a try. Be sure to pop on over to the SCS Store to see all the new products and the SCS Blog for tons of inspiration. Both pages are beautiful. 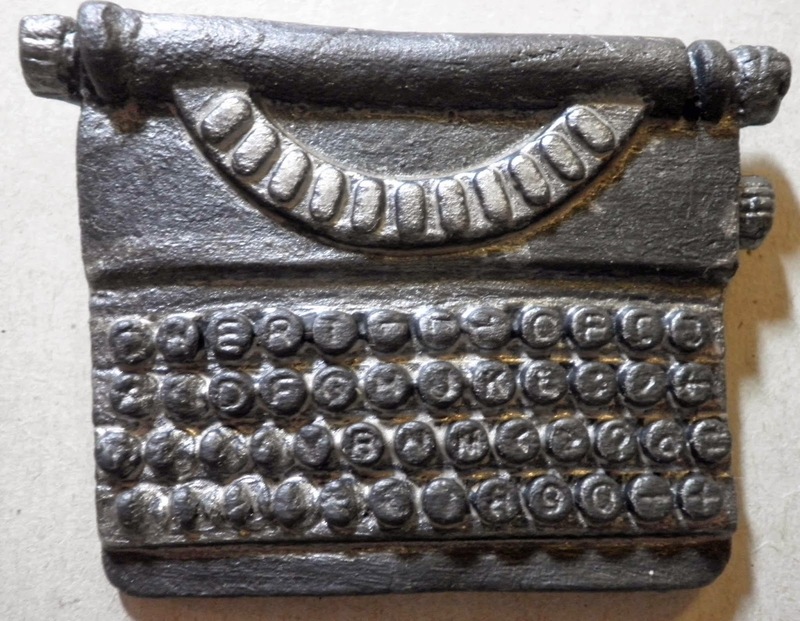 I bought that typewriter, too. I never used it on a project because it is so heavy. 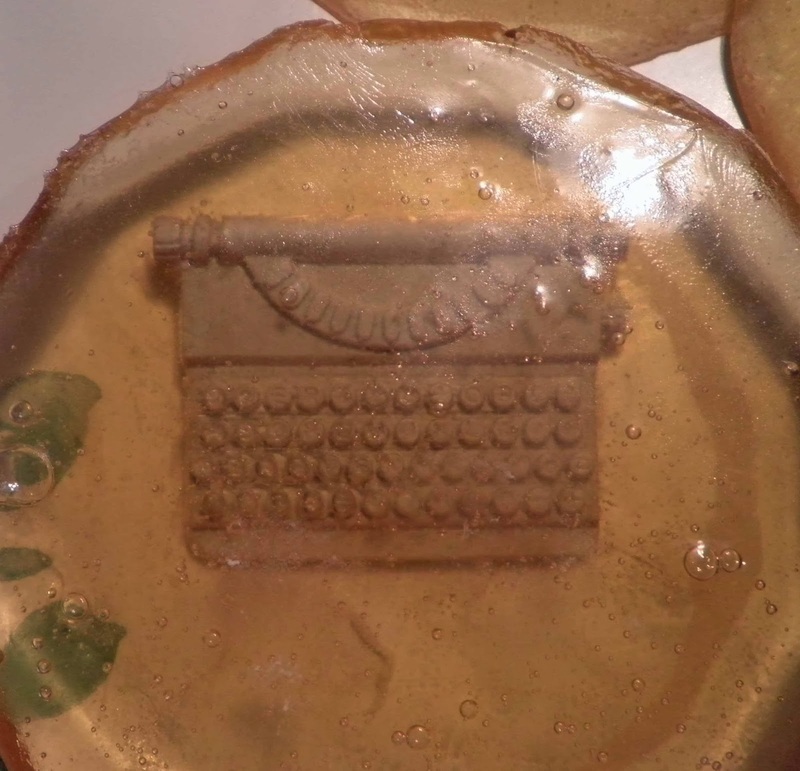 Your mold idea is very cool! It would be lighter and I would think a lot easier to adhere to the page! Thanks for sharing. Awesome project! 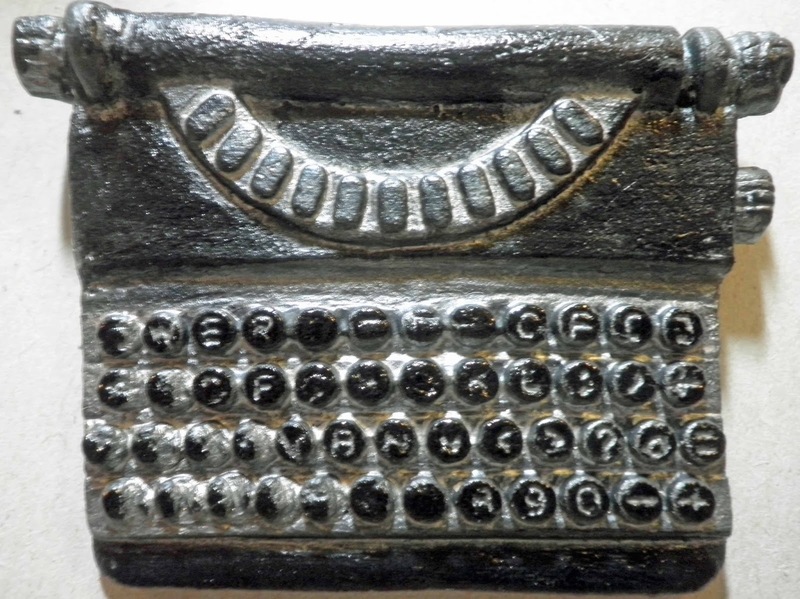 I love the typewriter and how you painted it! Thanks, everyone. I really love ComposiMold. It is a wonderful product and so easy to use.